Chevrolet fires another shot across the bow of the Nissan GT-R. The last time at the track, in slightly damp conditions, Nissan improved their Nurburgring lap time to 7:24.2 from 7:27.5 putting it just under the ZR1's last time of 7:26.4. For the latest quick time, the ZR1 was equipped with the optional Michelin Pilot Sport Cup tires, which as you can tell in this photo, are just about a purposed built, DOT tire. 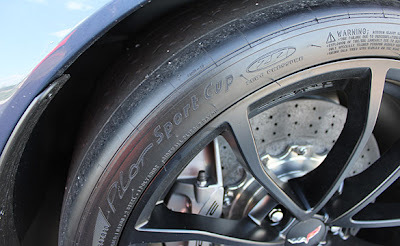 The Pilot Sport Cup tire is a very good tire, a very quick tire. The car also has a new version of the Performance Traction Management. Nissan is supposed to be back at the 'ring soon with a 2012(US) Nissan GT-R. Will we see a under 7:20 time?